HOMEJob ConditionsWhat will your day at work be like? Ever wondered what a day in the life of an instructor at Linguage is like? 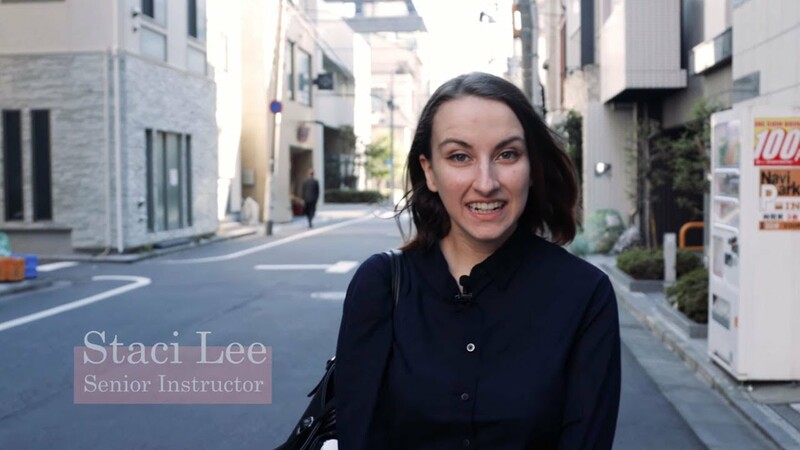 Find out more as we follow Staci, a Linguage instructor in this short video! At Linguage you can choose a work shift that fits your lifestyle. The schools are open from 7:00 to 24:00, so the schedule will be different for each instructor. Arrive at work a little early to clock in for your shift and check your schedule for the day ahead. Go to your table about 5 minutes before your lesson is scheduled to start. Make sure everything is set up and working properly. As your students start to arrive, chat with them and help them transition to using English. No Japanese during class! Beginners are usually shy and not very talkative. Take advantage of the 40-minute lesson, to help them express themselves and have fun. Between classes take a seat at the “Free talk table”. Our students love the free talk table because they can get to know other students and instructors and practice speaking in a more informal setting. Although level 1-3 students form the majority of the student body at Linguage, we do have a growing number of intermediate-level students. They will need your help with forming longer sentences and using more advanced grammar. There is a lot to do in 40 minutes so make sure your tempo is good and everyone is keeping up! A prospective student has come to try Linguage out. During a 15-minute interview and trial lesson you will judge their level do your best to convince them to join. Make them comfortable and make the experience a fun and engaging one! We want our instructors to give excellent lessons, every time. This is why we provide you with sufficient lesson preparation time. Free conversation lessons are a great chance for your students to put into practice some of the things they have learned during regular lessons. Free conversation lessons are structured and focus on specific topics covered during regular classes. Take a well-deserved break and relax. Gather your strength for the 2nd half of your day. At this level, your students will want to try out longer speeches and debate-style dialogues. Help them with new vocabulary and more natural phrases. Keep an eye on the talkative students, though - make sure all the students have a chance to talk and get your feedback! Roll out your idioms and fancy grammar for the advanced students. Remember to encourage and praise them a lot! It takes a lot of work to get this far and they will need your help with keeping their motivation up. Monthly events are an important part of the Linguage experience. From izakaya parties to movie nights and sports festivals – there is always something going on at Linguage for our students to enjoy. As a Linguage instructor you will have a chance to share your ideas, get involved in the planning phase and help out during the events. Before the lesson, check the student’s progress report and other notes to get to know the student. Private lessons run on a different schedule from group lessons, so double checking the unit and lesson you will be teaching is a must! Before clocking out, take a look at tomorrow’s schedule.